Cunard’s Queen Victoria, smaller sister to Queen Mary 2, was here in San Francisco on Wednesday picking up guests on her circumnavigation of the Earth — ending in Southampton in April. I’ve sold Queen Mary 2 before to some well-heeled travelers from both New York and San Francisco but hadn’t the chance to visit myself. Some of my impressions, and of course, photos follow. Size | At 90,000 gross registered tons (grt) she’s not the biggest luxury ship around (QM2 is 151,400) but she’s not the smallest either (Seabourn’s original ships are 10,000 grt and the newer ones are about 30). But the way she’s designed she comes across as fairly intimate. The hallways and various passages are narrow and subdued in color, and there are no atriums like in some hotels and ships, so one doesn’t get that super grand feeling. In fact, the only two public area where you really grasp the size of the ship are in the Queens Room (a massive ballroom) and in the theater. 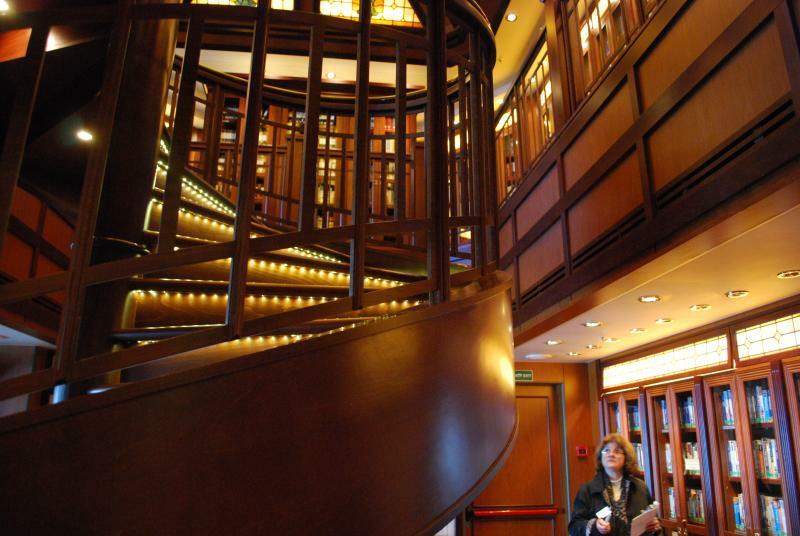 Dining | Cunard is well known for elegant dining and three distinct classes on board – the famous Queens Grill and Princess Grill. And the Britannia accommodations for everybody else. Britannia is fine – again it doesn’t come across as being massive and I don’t think you’d feel as if you were 1 in a million. The Queens Grill and adjacent Princess Grill is a different story. If you’re used to the smaller luxury lines, like Seabourn, Silversea or Regent, this would even feel small to you. These dining rooms are small, with service more personalized. Private lounges, patios and exclusive suite accommodations accompany the Grills but the experience culminates in the restaurants. Dress | Cunard makes no bones about the onboard ambiance. This is not like any other cruise line these days. Gentlemen are expected to dress in a tuxedo on formal evenings and the ladies in their finest. When I asked a staff member about this he was mildly horrified that I’d even brought up the subject. However he also told me that about 5% of the men just wear dark suits. Quelle horreur! Decor & Cabins | It’s classic, traditional and nautical. And it’s historical. Everywhere you’re discovering old ship memorabilia including models, menus, souvenir booklets and massive photos of past guests like Jerry Lewis and Dean Martin. And there’s a lovely photo of Camilla Parker Bowles, the ship’s Godmother, in case you forgot you were on a British ship (forget that it’s owned by Carnival). The ship is all wood, of a medium brown hue. 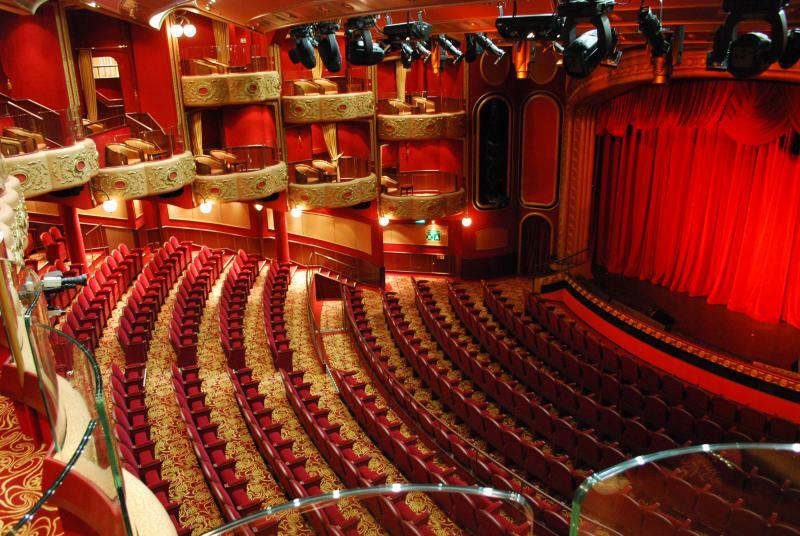 As a matter of fact, the entire ship is not too many shades away from this color, with the main exception being the Royal Court Theatre with its bright red velvet curtains. 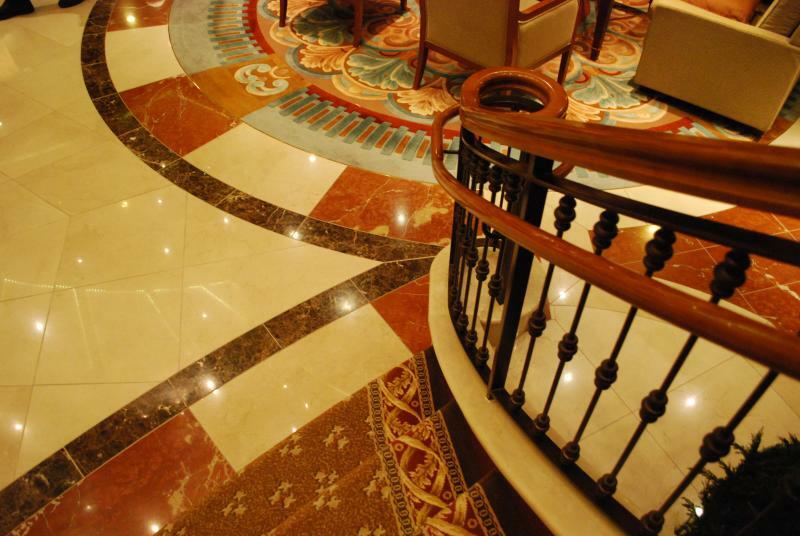 Service | My clients have loved Cunard and its White Star Service. And certainly the feeling on board the ship was very friendly. Keep in mind it is a very large vessel and the crew to guest ratio is not what you’d find on Seabourn, Silversea or Regent where it approaches 1:2. On Queen Victoria, it’s about 2:1. In January 2011 look for the introduction of QE2’s replacement vessel, the Queen Elizabeth. She’ll have 4 dining rooms, adding a level in between the Brittania and the Princess Grill. This is a great idea and a great value. Queen Elizabeth is the same size as Queen Victoria, with 85% of staterooms having an ocean view, 71% with balconies and 12% Grills Suites. If you’d like to learn more about the Cunard queens, other luxury cruise ships or anything else about the world of luxury travel, please contact me in San Francisco’s Financial District via phone 415.248.5079 or email: josh [at] joshfriedmantravel [dot] com.